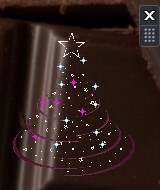 To really enjoy this Christmas tree you’d better use a rather dark wallpaper, because the tree is transparent. On a lighter backround the tree is still beautiful, but more minimalistic. Bright stars glowing after the mouse passes over them and reveal the background of the desktop.